Yes, it’s almost been two weeks and I’m just now writing about it. You’ve probably already heard all about what happened. I got there probably around 5:30ish and there were about 15 or so people in line in front of me. 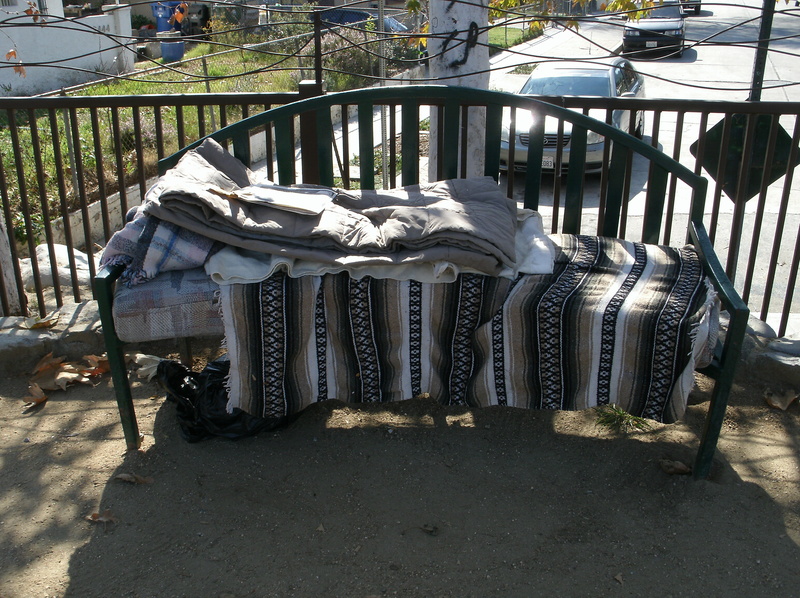 The line was going behind the Metro PCS store and into the alley behind it. Believe me when I say, this place was a little hard to find in the wee morning hours. 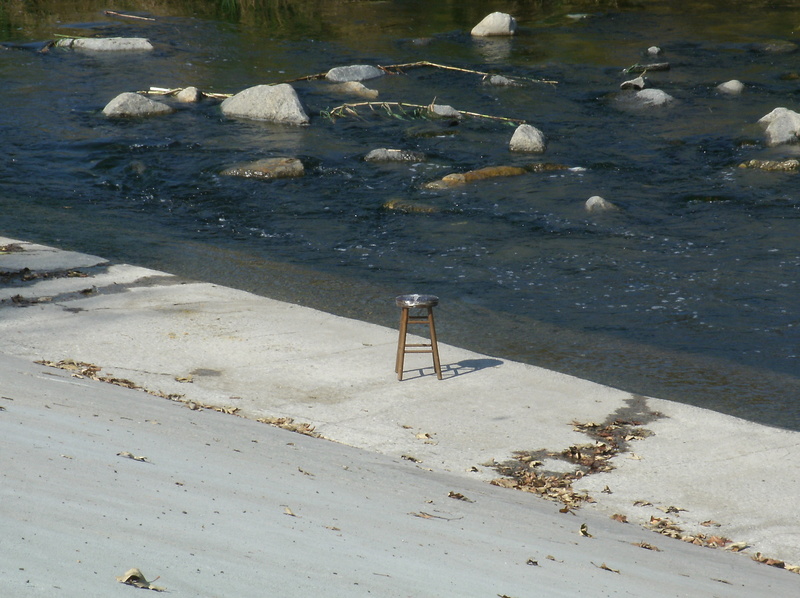 I drove past it and had to turn around before we found it. Tiny parking lot. I ended up parking behind the cocktail place next to the Metro PCS. The line kept growing and growing and growing. When Metro arrived, they had us move the line towards the front of the street so it went around the cocktail place and then back in the alley. For those of us who were there in the wee early hours, we got some free entertainment from a man who obviously wasn’t there for the signing. I know I have pictures somewhere. I just can’t find where I put them. About ten till noon, the DJ on the mic started signing, Loney will be here in ten minutes. Five minutes later, Loney will be here in five minutes. My friends and I were like, are you sure? We didn’t think he’d actually be on time this time. 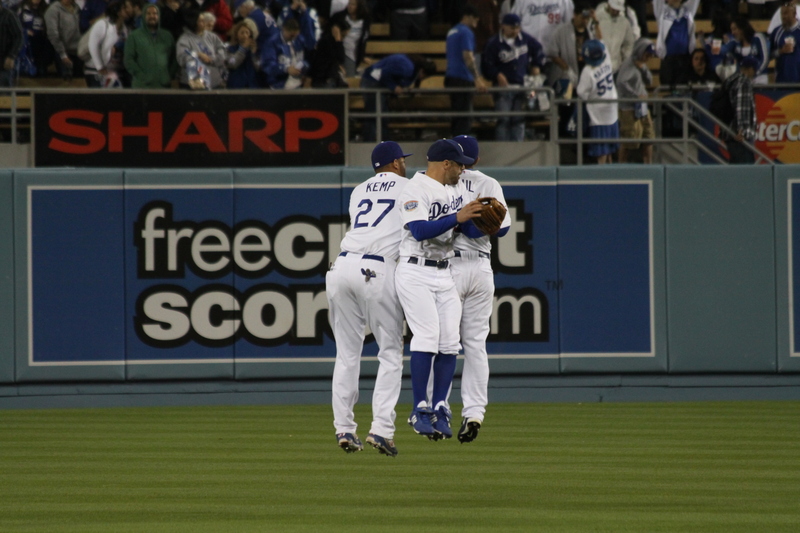 Sure enough… after 20-25 minutes of the DJ saying, Loney will be here any minute now, he finally pulls in. It was funny to see him wince a little with all the screaming when he got out of the car. I wonder if it was the high-pitch girls screams or the signs that said “will you marry me?” that made him wince. Funny thing was, when we got there, I was like 15th or so in line. Maybe 20th. I didn’t count. About 11:30, this group of girls in short shorts (more like briefs) showed up and got in line. One of the Metro employees saw them and told them they weren’t there at 6:30 in the morning and needed to move. They didn’t move far. They moved like five people back in line. It was quite frustrating. I went from somewhere in the 15-20 to probably like 40-50. There were a ton of people in front of me who showed up at the last minute. We finally got in. He signed my bobblehead on the brim this time. He signed my other one on the cap. This one is going to my cousin Joanne in North Carolina. 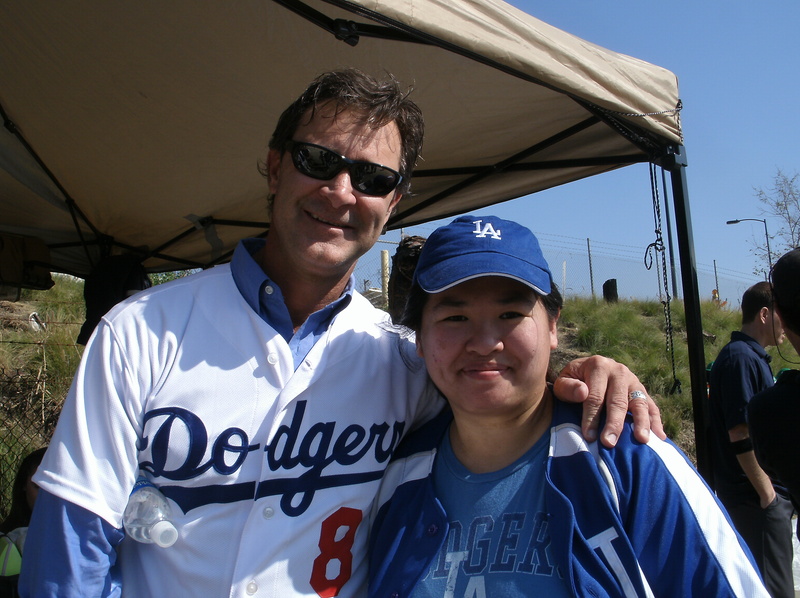 She came to visit in 2007 at the start of my Dodger obsession and she got hooked, too. When she went back to NC, her older brother was giving her a hard time. He was telling her that she wasn’t a Dodger fan, she wasn’t a real fan. Then she started listing some of the players. His reaction? “What has Linda done to you?” Loney was her favorite player then, so when she was supposed to visit this summer, I was so excited about taking her to Loney’s bobblehead night. Well, her plans fell through and she didn’t make it. So, I got her bobblehead anyway and plan to take it to her next time I visit. Not so sure if I want to risk sending it across the country. After we finished, it was time for lunch. However, because I had parked next to Metro and behind the cocktail place… not only was there an employee vehicle double parked behind me … but a cop car behind it. There was a lot of police presence there. The officer has just gotten out of his car and when he saw me looking at the cars in the lot, he asked me which car was mine. I pointed to it and he said, “you’re screwed.” It was funny how he said it. So, we went out to lunch. Surprise, surprise, we got lost getting to lunch. 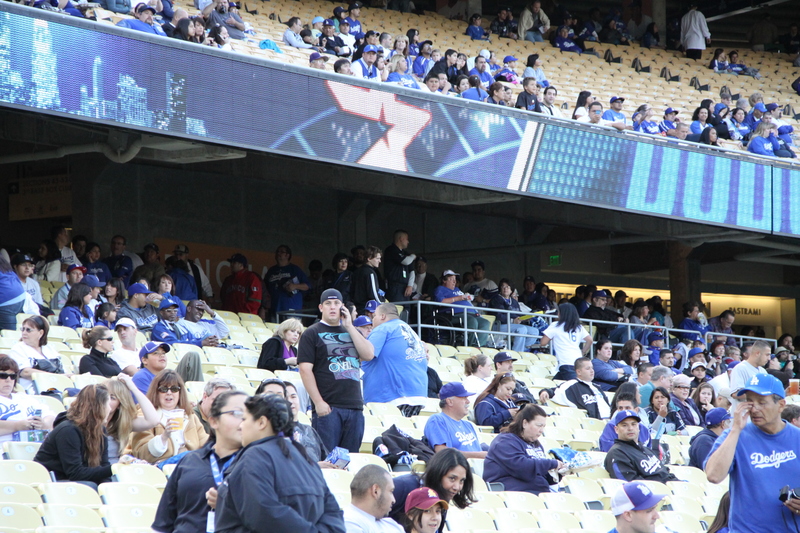 On the way back to Metro, Vin Scully Is My Homeboy called me and asked me if I was still at Metro. He was getting emails and tweets about the aftermath of the Loney signing. By the time we got back, it had been long over. 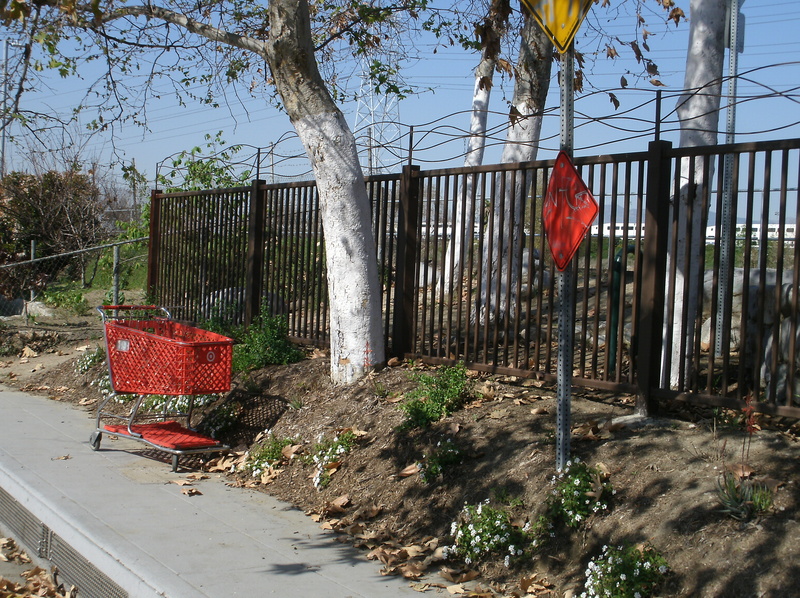 There were no signs of any police, near riot, or any trash lying around. They must have cleaned it up real quick. There were anywhere from 600 to 1000 people in line. No way was Loney going to sign more than 150-200 autographs. Sure, he arrived late. But, he stayed the extra half hour or so that he was late. And Loney isn’t like Broxton. He talks to fans as he’s signing. He doesn’t just sit there, not look up at the fans, and just sign. He does interact. Shame on those “fans” for their awful behavior. I know I’ve been upset at signings before, but I was usually one of the first people in line and they were telling me or people in my group that we weren’t going to get in to get our autographs. 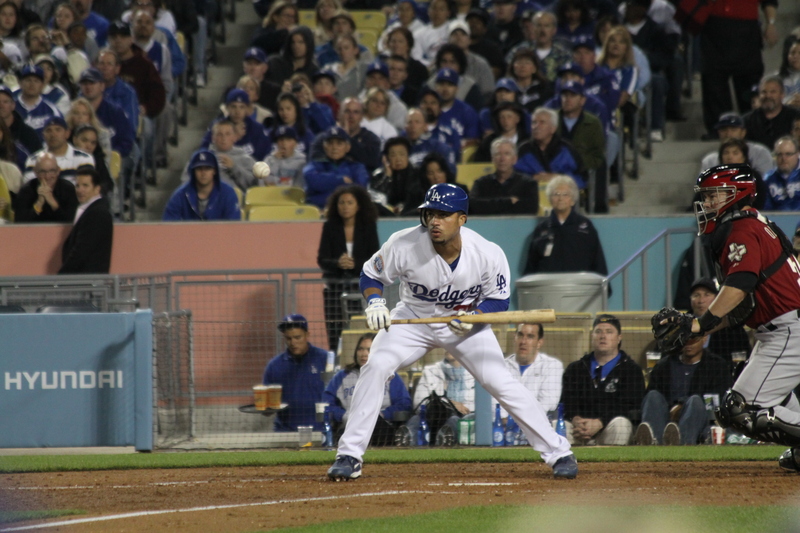 Who knows what’s going to happen at Furcal’s signing this Saturday. The VIP list alone is already ridiculously long. Who knows if any of us “general public” people will get in. We shall see. Last night I got my 10th Dodger bobblehead. 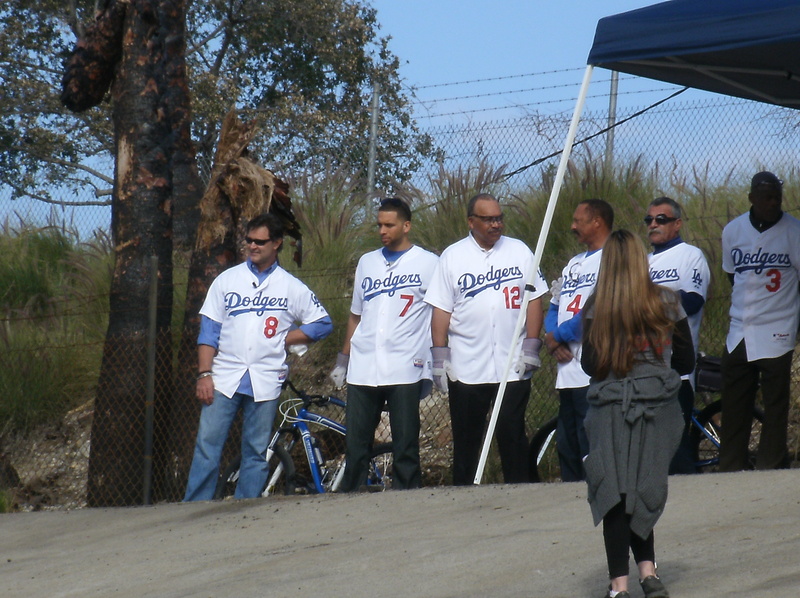 My collection now consists of Russell Martin, Takaishi Saito, Brad Penny, Takaishi Saito, Joe Torre, Casey Blake, Manny Ramirez 1, Matt Kemp, Manny Ramirez 2, and Andre Ethier. 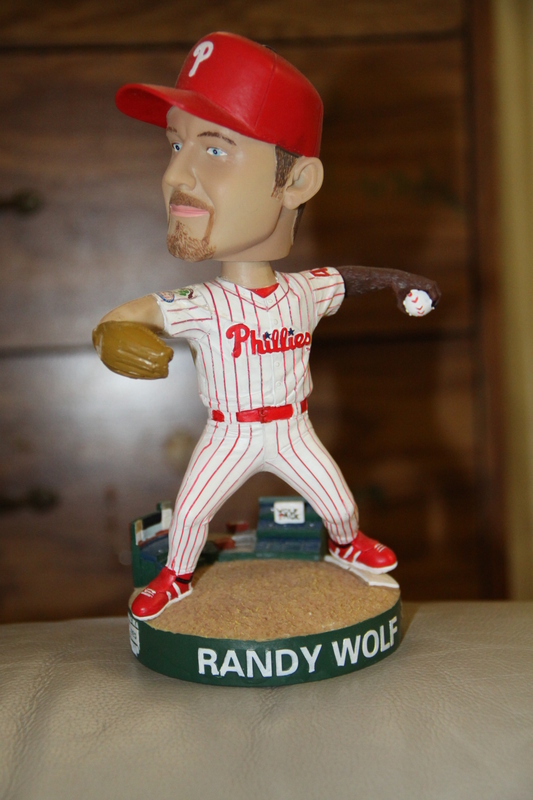 However, my favorite bobblehead is the one I got off Ebay. Yup, sure it is. Randy Wolf. 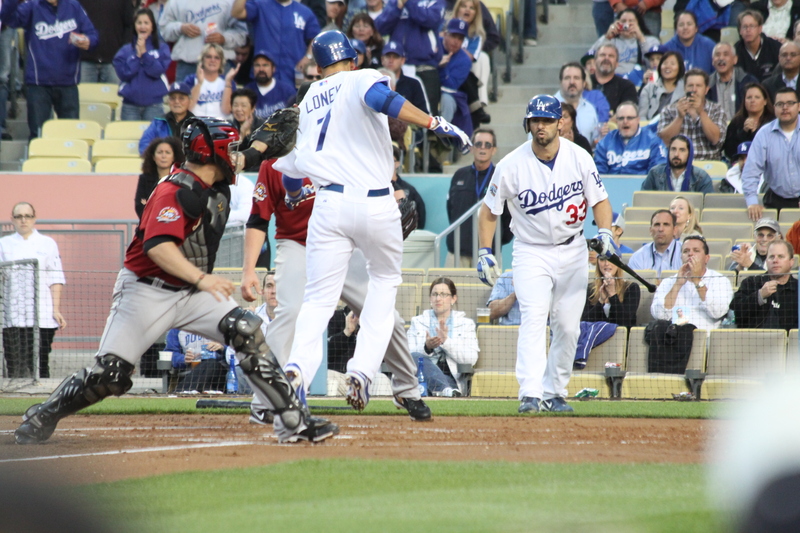 Last night being Andre Ethier Bobblehead night, Andre did something I do not recall seeing any player ever do. 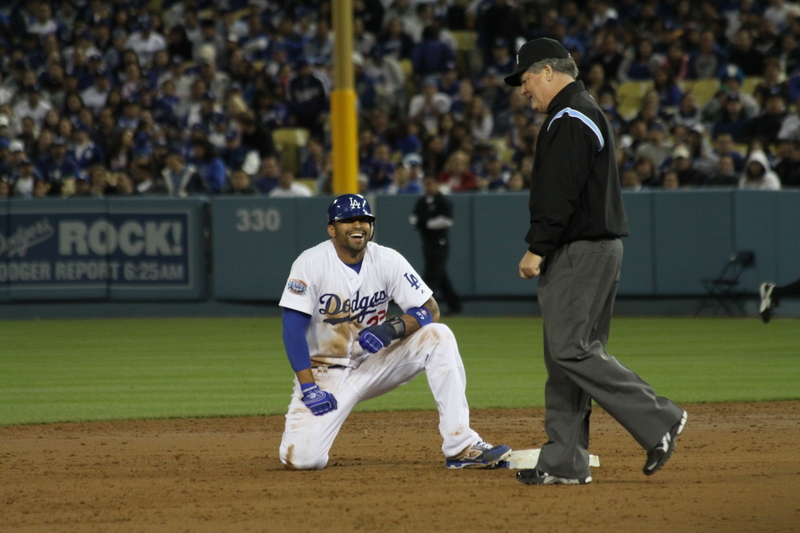 Then again, I guess being on the DL he had time. He spent about 30-45 minutes signing autographs at the Kiddie Korral. No joke. They rotated the people in and out of the Korral about four or five times. He signed everything from baseballs to caps to bobbleheads. He even put the drama of last year’s photo day behind him and posed for pictures with several fans. Word must have got out fast. Because the line got LONG. 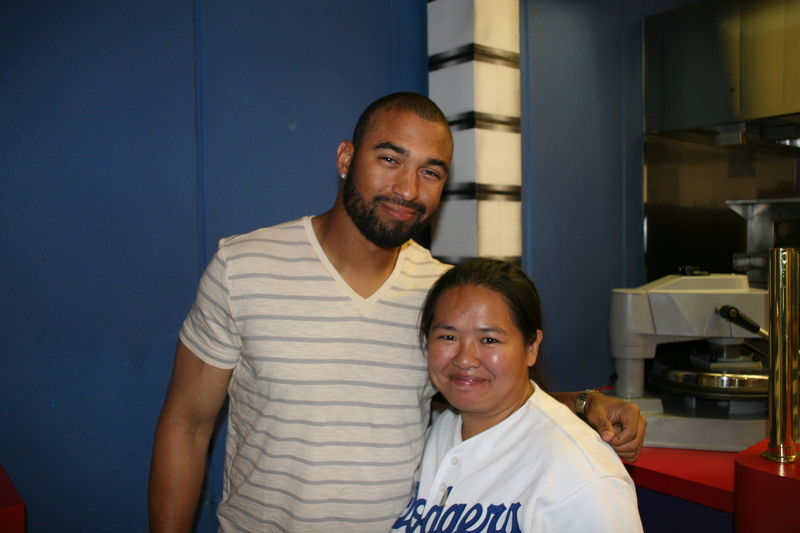 I called Dodger Talk to mentioned this and the call screener asked me if I got Andre’s autograph. I said no. He asked me why not? Didn’t I want it? I said the line was too long. It was ridiculously long! Maybe if I had gotten in line at 5:45, I could have gotten it. Oh well. 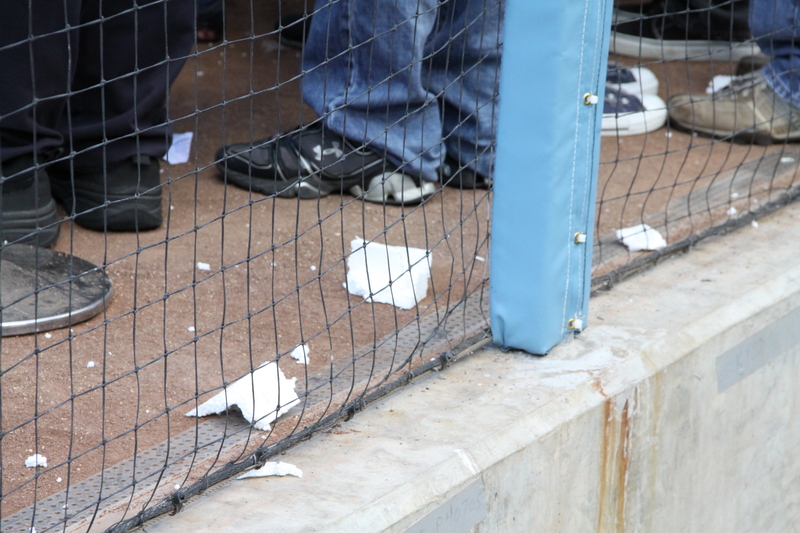 Here’s the mess left behind by people who were taking their bobbleheads out of the boxes while they were in the kiddie Korral. Someone even lost the bat to the bobblehead. Man. Every player on the DL should spend time signing autographs. Just one player per game. Come on. How awesome would that be? Yesterday Andre, tomorrow Raffy? If you’re friends with Jon SooHoo on facebook, then you’ve seen this picture from his vantage view on the other side of the plate. Here’s Blake DeWitt thinking, man that was close! 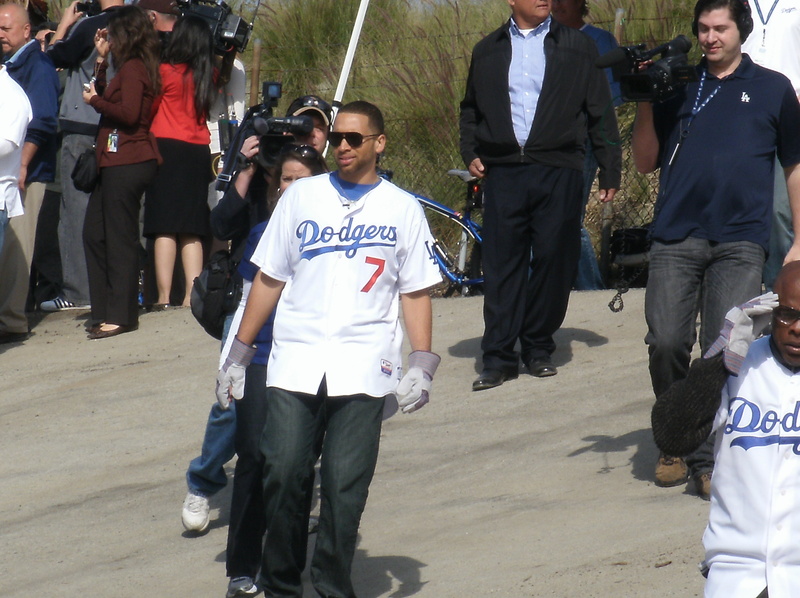 James Loney has been putting the wheels in motion. He stole his 6th base of the season last night. He also tagged up and scored on a sac fly that I think most fans weren’t sure if the ball was deep enough. Xavier Paul putting the ball in play. 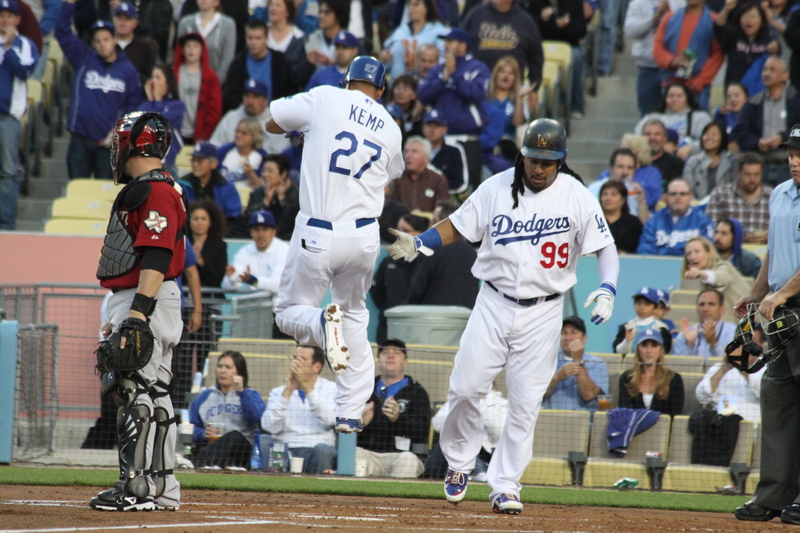 Matt Kemp caught stealing second base. 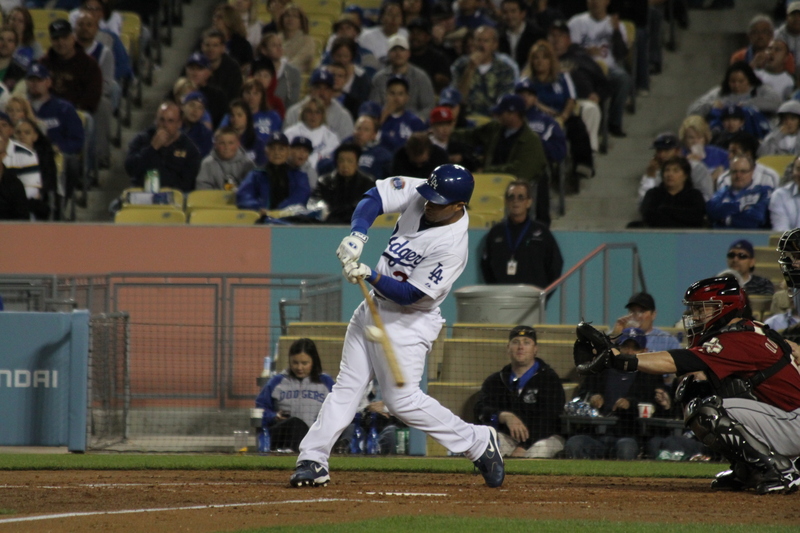 Xavier Paul watching the ball bounce away as he lays down a perfect sac bunt. I think Xavier Paul forgot about the celebratory air bump. He started running in, then turned and looked at Matty. He changed his course and headed to center field instead of towards home. So, I knew about this event ahead of time. But I didn’t plan on going. Until JoAnna put up a picture on her facebook! 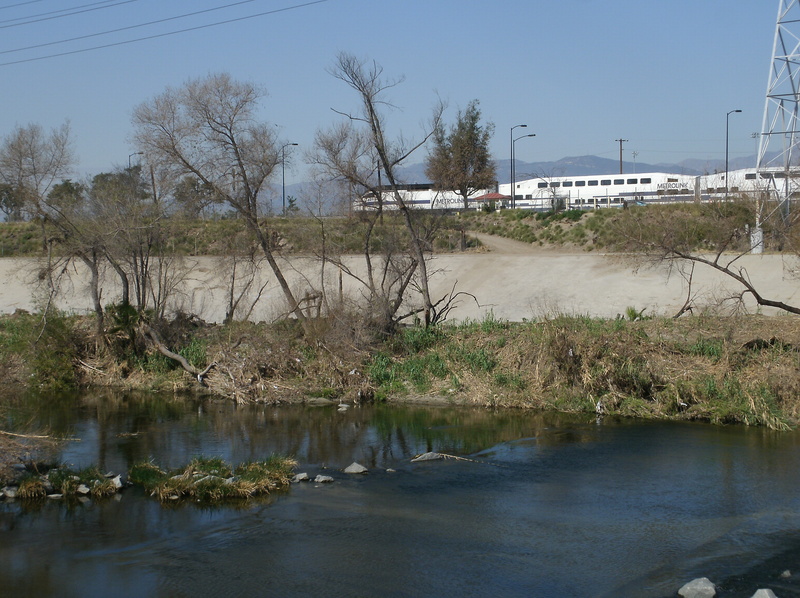 One text led to another … and before I knew it… I was at Skateland in Northridge. The first player I saw was Orlando Hudson. He was talking to someone else … who turned out to be Jon Garland! Since I only brought my scrapbook and Orlando signed it already, I only asked Orlando for a picture with him. After all, I wasn’t able to take a picture with him at Living Spaces. Well, Angelina snapped a quick one… but he was talking in the picture. 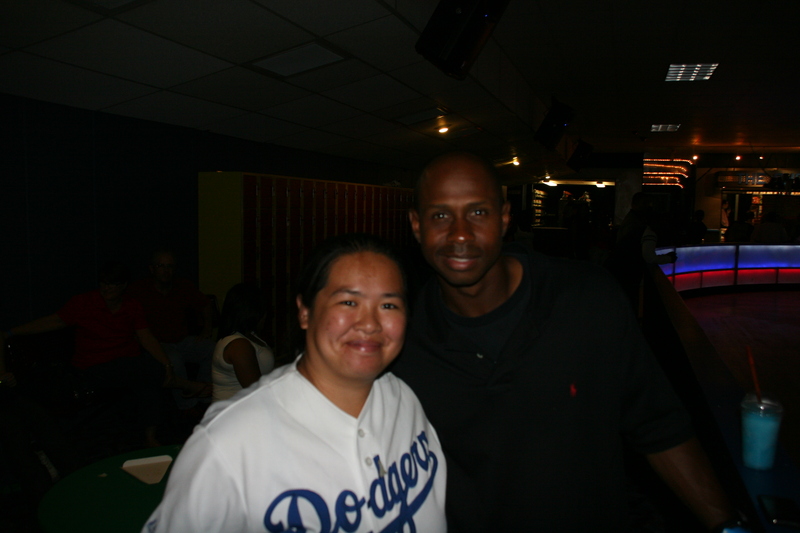 Here’s the picture of me and Orlando at Skateland. 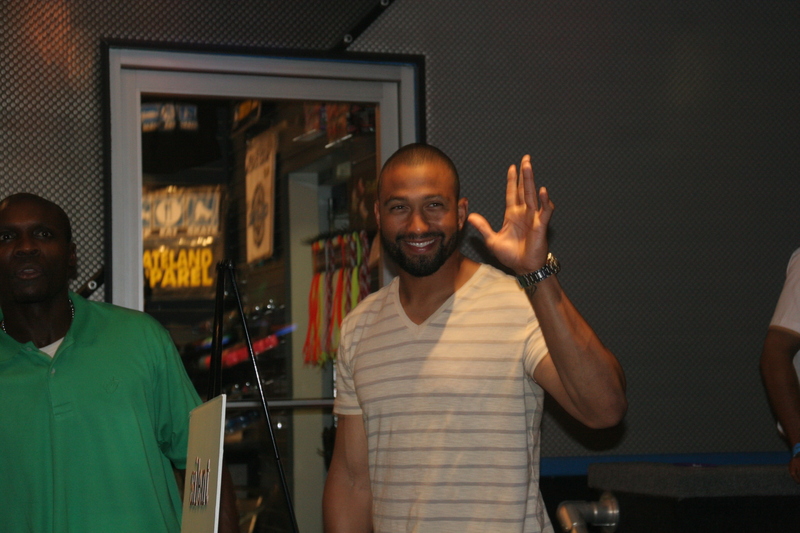 Here’s the picture of me and Orlando at Living Spaces. See the difference? Next, up, Jon Garland. 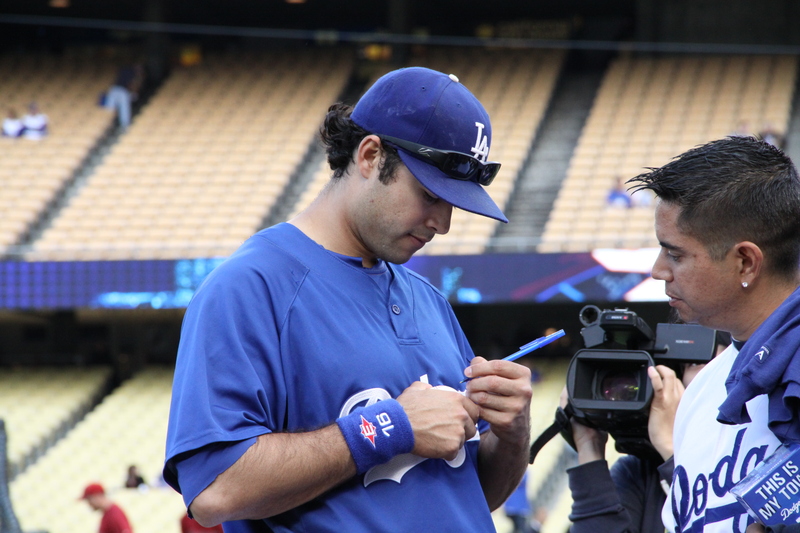 Oh my… I got his autograph on Wednesday at Dodger Stadium. He was so nice. He signed tons of autographs that day. Wonder if he remembered me as the person who accidentally marked his hand? 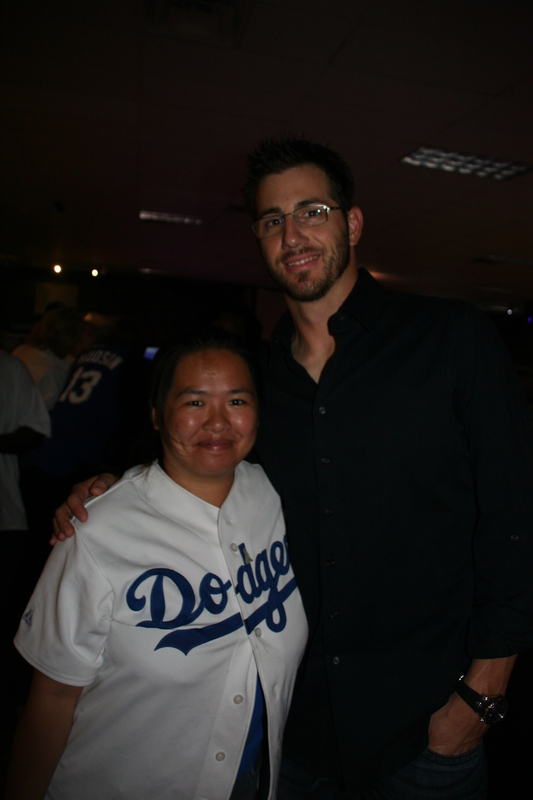 Oh my… I love guys in glasses… and I think Jon Garland may have a chance at stealing my heart away from Randy … depends if he comes back as a Dodger next year. 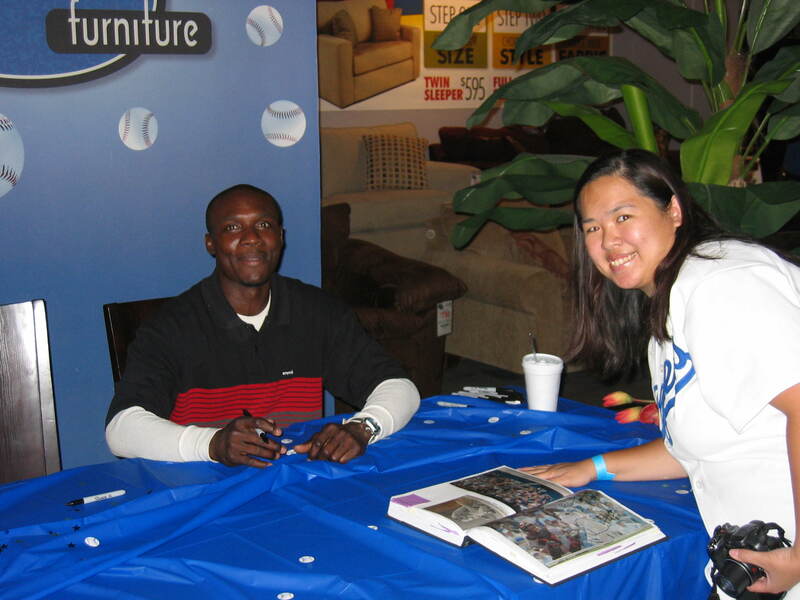 I should’ve asked him to sign one of his baseball cards that I had in my purse. Or the baseball. But I was too hyped up to stop and think logically. 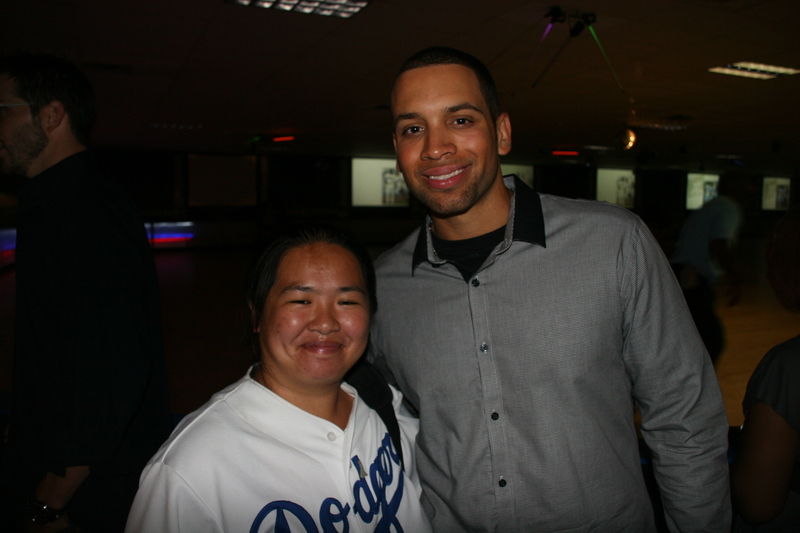 James Loney was next. You can see Jon Garland walking out of the picture. I had thought about getting a group shot … but figured individual pictures with each player was better. I asked him to sign my scrapbook. I had a page marked for him… though I have to admit. When I got home, I found some better pictures that I could’ve asked him to sign. Oh well. He asked me and JoAnna if we were going to skate. I said I wasn’t cuz I had hurt my knee someone at the game the day before. JoAnna and I talked to him for a little bit. Juan Pierre was the last player we saw in the main room. I was so excited to meet him. I’ve met or gotten autographs from the other four players already there. I was really looking forward to see Juan Pierre. However, I didn’t have a tab in my scrapbook for him. So I had to flip through my book real quick to find a picture of Juan. Finally found one. JoAnna knew Matt(y) was around somewhere. She told me that he was puzzled when she called him Matty. I’m not sure who started it. It was either JoAnna or Cat. One of those two. He was eating and I was like, “oh no, I don’t want to bother you while you’re eating.” He put down his pizza and said not a problem. I asked him to sign my scrapbook. He asked me, “What do you have one me?” I told him, “what don’t I have?” Fortunately, while I was flipping through the book looking for a page for Pierre, I saw a page I wanted for Matt. When I got home, there were so many good pictures of Matt that it was hard to choose just one. I’m happy with the one I chose. He signed it and then I asked him for a photo. He grabbed a napkin to make sure he didn’t have any pizza sauce I guess. I jokingly told him that he missed a spot. 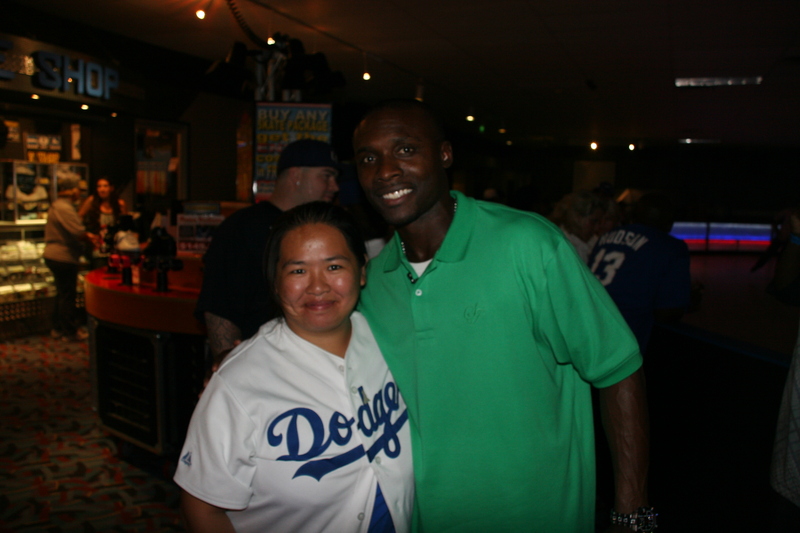 And I also asked him to sign a baseball for a birthday gift. I went around and got Loney, Hudson, and Pierre to sign the ball too. I looked for Garland, but he was gone by then. outlets for proper therapy, education, and extracurricular activities. force to defeat the growing developmental disorder. The players mingled a lot. People were either hanging around, skating, or dancing! The event was scheduled from 8 – 12. I got there a little after nine and left a little after 11. I had a blast. I loved the event. It was an interesting event to be at. I got a lot of autographs this week! Not bad for a week, huh?